Since early spring I've had some soreness and loss of range of motion in both shoulders. I thought that they were improving -- my right definitely was. And then one day I woke up almost completely unable to move my left arm from the shoulder at all. At least, not without howling in pain. Turns out I have adhesive capsulitis, or frozen shoulder. Until this happened, I would not have guessed how hugely inconvenient it would be. After all, I've still got one good arm, right? Well, practically everything I want to do is almost impossible one-handed. Okay, that's an overstatement. I don't have much trouble cooking, for example, or driving. But: getting dressed, working in the garden, making pots...even reading is much more difficult. I've postponed the firing I had hoped to do this week; I don't even have a good guess as to when I might reschedule. My shoulder is light years better than it was, but it is still drastically limited, and I am very afraid of re-injuring, further slowing a recovery that my doc says will take months as it is. So I do my exercises faithfully, and am ever so careful. So, anyblah: I might try throwing tomorrow, just some small things. On the up side, work has begun (Doug's work, that is: building goes on the long list of things I can't do right now) on the kiln shelter! And a nice day is finally on tap for tomorrow. Oh, so sorry about your shoulder! I had the same thing last summer. I worked with a PT for about 2 months. Now a year later, I still have about 70% ROM reaching behind my back, but all other directions is back to normal. Keep working it gently & recover soon. Gee, that sounds terrible. I know what it is like to be severely limited in movement - when my back goes out I can't do anything. It sure makes me feel helpless. Over the last several months I have had several days when I woke up either in the middle of the night or in the morning and could not move my left arm and had to move it with the other arm; I thought I slept on it wrong, but it happened several more times - once I got it moving it was ok. I hope you get better real soon. Sorry to hear about your shoulders. I had impingements in both of mine, but nowhere close to frozen up. I did go to PT and then worked my exercises. I cannot emphasize enough to keep up with the exercises!! They help so much. Good luck! 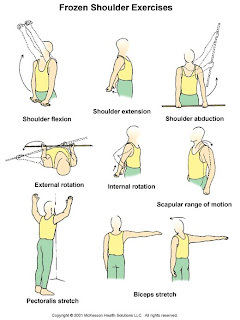 BTW, the two that really helped me a lot were the shoulder abduction and external rotation exercises. Hugely inconvenient to say the least. Glad to hear there is some improvement. I have had some experience with this and was constantly surprised about how many things you need both arms working together to do.